Our tour of the Bordelais and the Gers in 7 days, max. 14 people, two double-nights. By eBike through the Gers, the home of musketeer d‘Artagnan, a gentle country with good food; Duck confit and pastis, tariquet and armagnac, opulent meals of the Gascogne in an area richly spoiled by nature. World-renowned wines, nostalgic little towns, small harbors and picturesque fishers‘ villages, Gironde and the Atlantic ocean always fighting with their tides, oysters in the Bassin d’Arcachon and Dune du Pilard, „finale furioso“ in the Bordelaise and the most beautiful town of France. Day of arrival: to Moissac on Saturday. Booked by you or pedelon on request. Flight to/from Toulouse right from Munich or with changeover from nearly any German town. From Germany, Austria and Switzerland, the train will take you to Moissac with several transfers in 9 to 12 hours. It’s about 12 hours from Hamburg and Berlin, and two transfers are not avoidable. There is a direct motorway connection to Moissac, at 1,500 km from Berlin, 1,000 km from Frankfurt, 1,100 km from Munich and 1,300 km from Hamburg. You can leave your car at the airport of Toulouse (approx. € 80/week) or in Moissac during your bicycle tour. With your booking confirmation, you will receive the “pedelon travel information”, which contains useful notes on traveling to Moissac and other advice around your trip. Arrival by Lufthansa to Toulouse or by the participants‘ own car to Moissac; The shuttle bus will take you from the airport to Moissac in just under an hour. Departure at 6 PM at the airport of Toulouse; The pedelon partner hotel „L’ Armateur“ is among the best inns in town (swimming pool), but rather modern-functionally designed and the simplest hotel of the trip. Before dinner at 8 PM, you can enjoy the calm and relaxed atmosphere at the banks of the gently flowing Garonne or walk through the picturesque old town with its medieval alleys – a special enjoyment in the evening hours, when the deep red of the old bricks is made to shine with a special radiance in the evening sun. For the first dinner of the bicycle tour, talented chef Colin Lochin will receive his guests in the restaurant of the same name in the „L’ Armateur“. After breakfast on the pretty hotel terrace, the pedelon eBikes will be adjusted and participants will receive a detailed explanation. It‘s just a short trip by electrical bike to the abbey Saint-Pierre, which is part of the UNESCO world heritage. The monumental Western portal of the abbey church from the 7th century with its illustrations of the Last Judgment is particularly worth seeing. It is deemed one of the master pieces of Romanesque sculpting. 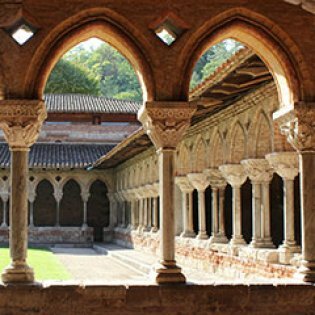 The cloister dating to 1100 AD, which can be considered unique in the world thanks to its outstandingly preserved condition, is just as interesting. After the detailed tour, the bicycle path will continue on the „Véloroute des deux Mers“, which connects the Mediterranean to the Atlantic ocean, leaving the town and always following the banks of the Garonne West. It is an ideal route to become familiar with one‘s eBike. After almost 20 km, the cyclists leave the river valley and reach Auvillar. The calm village is situated on a rock precipice that offers a long view of the Garonne towards the coast of the Aquitaine and Quercy. The somewhat sleepy town with its market place arcades and the adjacent half-timbered houses is now considered one of the most beautiful villages in France. On a picturesque route that is dominated by vineyards and fields, the bicycle section will end in Lectoure late in the afternoon. The „town of the arts and history“ and capital city of the Gascogne, with its powerful cathedral St Gervais and the castle of the count of Armagnac, is an ideal location to end today‘s leg. The last 40 km to the hotel are bridged by a short interim transfer, or can be cycled with fresh batteries if desired. In Fourcès, perhaps the most beautiful village in the Gascogne, the bikers will find the „Chateau Fourcès“, a guest house of a special kind. Monsieur and Madame Lesfarre have fulfilled their dream of a charming hostel in the castle (swimming pool and double overnight stay). Enjoy a very good dinner in the only restaurant of the village. After breakfast, today‘s round tour leads through the gentle hills of the Gascogne, which everyone will like immediately and where you will feel comfortable at once. Barely known outside of France, the home of musketeer d‘Artagnan has been spared large tourism flows until now. The pretty landscape is supplemented by an important architecture and cultural heritage with fortresses, castles and wonderfully picturesque villages. The first jewel on the morning‘s tour is the former Cistercian abbey Flaran, a masterpiece of sacral architecture that is now the cultural center of the Departement. On the way to Condom, we will cycle through valleys shot through with vine, cypress- and umbrella-pine-lined hills, brown fields and radiant rapeseed fields. In the historical capital city of the Armagnac, we will stop at the traditional Armagnac producers‘ and in the Armagnac museum. On the way back to the hotel, we will cross one of the most beautiful villages in France: the defensive Larresingle, where it seems as if time has stood still for centuries. The restoration and maintenance of the small village has been accepted by an American foundation from Boston up to today. Late in the afternoon, we will return to Fourcès. Today, dinner will take place in a specialty restaurant just a few kilometers away. After breakfast, the charter bus will complete the trip to Gers, taking the cyclists to Duras, 110 km away, in an hour and a half. The palace of the same name developed from a medieval castle in the 18th century that turned into a magnificent villa with a labyrinth of thirty rooms. After leaving the town behind, you will reach the Bordelaise after just a few kilometers. In the largest connected wine-growing area in the world, more than 3000 vineyards produce world-renowned high-quality wines. In the early afternoon, we will reach the small town of Pelllgrue. The cornerstone of this Bastide was laid by Henry III. of England in 1280. The market hall, influenced by the world of Gustave Eiffel, is particularly worth seeing. Traffic-free paths will soon take us to St Émilion, world-renowned among wine experts. Today, the region houses about 5,200 ha worth of vines, owned by approx. 1,000 winegrowers. Today‘s bicycle leg ends with a tour of the picturesque village. Late in the afternoon, when the visitor streams have slowly ebbed away, a walk across the old cobblestones through the narrow alleys, a visit to the pretty collegiate church or sitting in one of the street cafés at the „Place de Marché“ is particularly nice. It is hard to imagine that there are four hectares worth of subterranean galleries below the visitors here. 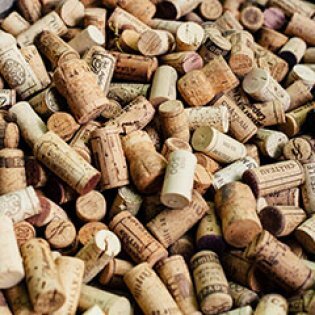 At a humidity of 95 percent and a constant 13 degrees Celsius, they have been an ideal wine storage site for centuries. The cyclists are expected in the charming “Logis de Remparts”, which has comfortable rooms and a pretty park with a modern swimming pool. Located in the heart of St Emilion, it is only a few meters to dinner in a very good restaurant, which offers its guests the best “bistronomy” in a particularly beautiful setting. In the morning, the first somewhat traffic-heavy kilometers are bridged by bus in about an hour‘s drive. From St Ciers-sur-Gironde, we will continue on the eBikes towards Gironde with the largest estuary of Europe. 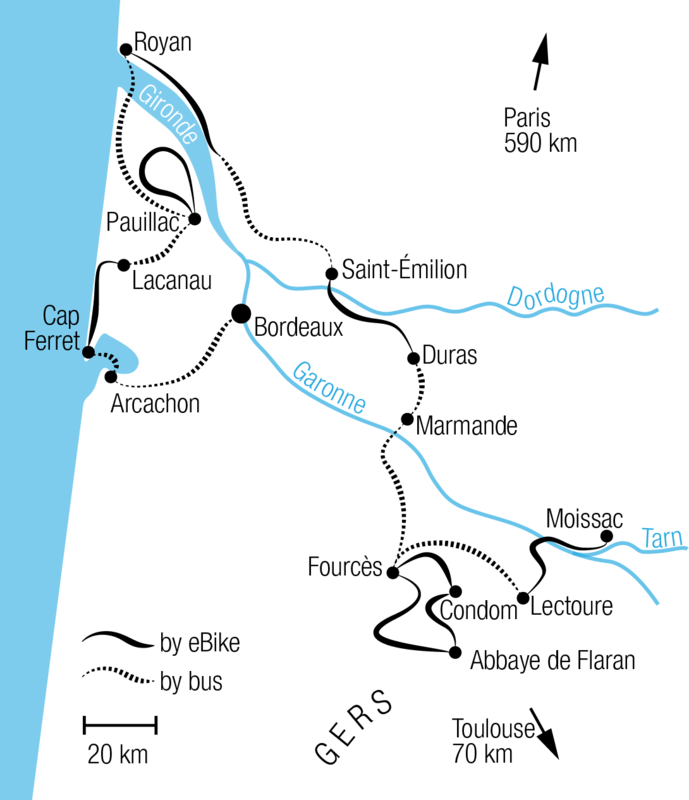 Here, the Gironde turns into the Atlantic ocean, or – if you prefer – the Atlantic ocean becomes a river, the only one in Western Europe that houses sturgeons. On entirely traffic-free paths, today‘s bicycle route leads along the banks of the Gironde to Royan. It is a memorable cycling tour through untouched nature, very similar to the Camargue, with picturesque harbors and through sleepy fishing villages. All of this forms a wonderful contrast to the cultivated landscape that we cycled through during the last few days. The „Carrelets“ are our continuous companions: fishing cottages typical for the region where fishermen have been fishing with dip nets for centuries. We will stop at a fish restaurant typical for the area in Talmont-sur-Gironde to enjoy the outstanding cuisine with a glass of Pineau de Charante. This place is one of the most beautiful villages in France. Its alleys are lined by innumerable roses and a citadel with its impressive Romanesque church is cuddled up against the cliff. On the ferry passage from Royan to the Pointe de Grave, we will see the impressive light house of the kings, the „Cordouan“. 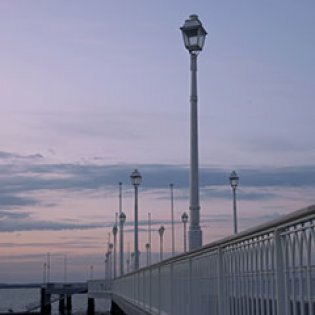 The oldest stone and light post of France has protected the estuary and the city of Bordeaux since the middle ages. It has a garden hall and a castle, a king‘s hall and a chapel. From the Pointe de Grave, the bus will take us to the Châteaux Les Ormes-de-Pez, a former vineyard at the heart of Medoc, converted into a small, comfortable hotel, in about 40 minutes. In rare cases, and when larger circles of friends need more rooms, guests are also accommodated in the nearby Château La Gravière. It‘s the lord of Château Les Ormes-de-Pez himself who will prepare dinner exclusively for pedelon cyclist. After breakfast, you will continue on your eBikes on a round trip to Haut-Médoc. The peninsula between Gironde and the Atlantic Ocean offers an unusual microclimate. 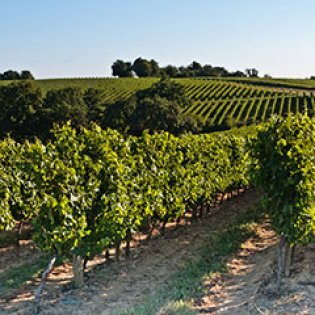 The region produces the highest-quality and most expensive wines in South-Western France. 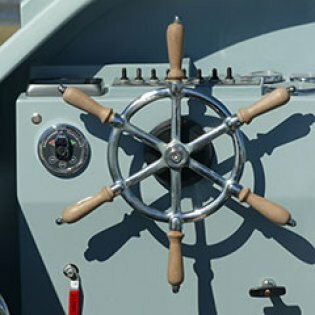 The first stop will be in Pauillac, where a longer break can be taken at the busy harbor. On the following leg there are likely the most famous vineyards of the Medoc right by the bicycle route: the Château Lafite-Rothschild and the Château Mouton-Rothschild, both impressive in their splendor and beauty. The Château Cos d’Estournel is one of the best-known vineyards. In continuous competition for the title of the most beautiful and most unusual castle in the Medoc, it had its winery built as a Chinese Pagoda with several curved roofs. The entrance gate is made up of the carved portal of the Sultan‘s palace in Zanzibar. Saint-Estèphe, a small but world-renowned town with its church towering high above is slightly raised in a sea of vines. After a fine picnic on the banks of the Gironde we return to the Châteaus Les Ormes-de-Pez and La Gravière in about one hour by eBike. For dinner, we will go to a very good restaurant not far from the Châteaux, which is frequently visited by the winegrowers of the area. In the morning, the first kilometers that are not very attractive by bike will be covered in a short interim transfer. 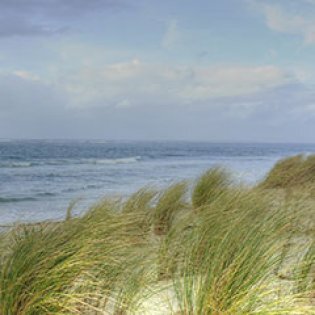 With a view of the seemingly unending white sandy beaches and the wide Atlantic Ocean, we will then continue by eBike. Today, the cyclists will see a particularly exciting and diverse section. After a few meters, they will reach the Vélodyssée, a new bicycle path leading from Roscoff in the North of the Bretagne down to Biarritz near the Spanish border. The route is approx. 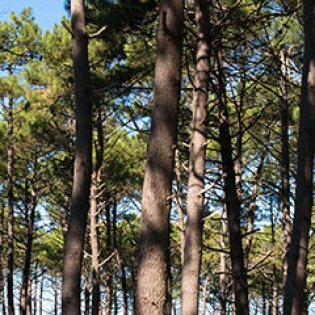 50 km along this bicycle path through pine and stone pine forests, past fresh water lakes and extensive swamp and moor landscapes, always in direct proximity to the Atlantic Ocean. A memorable leg that is entirely free of traffic while leading to the fashionable spa Cap Ferret, at the very end of a spit between the Bassin d’Arcachon and the Atlantic Ocean. During the transfer by ship, you can enjoy the wonderful views of the largest shifting dune of Europe, the „Dune du Pilat“, and the basin of Arcachon with its oyster banks. Served in style, with a fresh white wine from Bordeaux, its products can be enjoyed in the „Cabane de l’Aiguillon“ in Arcachon. Today‘s bicycle section with its rich impressions will end in the afternoon at the train station of Arcachon. A near-distance train will take you to the center of Bordeaux in under an hour. A little later, you will arrive at the pedelon partner hotel „La Maison Bord‘eaux“. The hotel is located In a historic building dating from the 18th century, not far from the Place de la Bourse and the center. The final dinner will take place at the restaurant „le Petit Marché“, which convinces by its down to earth – but nevertheless refined cuisine. „Bordeaux is France‘s most beautiful city“, as Stendhal claimed already. The capital city of the region of Aquitaine in South-Western France not only offers the best wine and outstanding restaurants, but also a wonderful cityscape. The nearly entirely retained city core has been carefully restored and is now part of the Unesco world heritage. The renewal of the banks of the river Garonne with the kilometers-long promenade and the newly designed harbor docks has been particularly successful. After breakfast, the most beautiful and most important sights will be visited in a detailed city tour, with a city guide to provide in-depth information. Around noon, the pedelon guests will take the TGV back to Toulouse, where they will arrive after about two hours. All flights after 5 PM can be reached easily. You may also spend another few days in Bordeaux. Useful advice for an additional stay can be found in the pedelon travel information that will be sent to you after your booking. 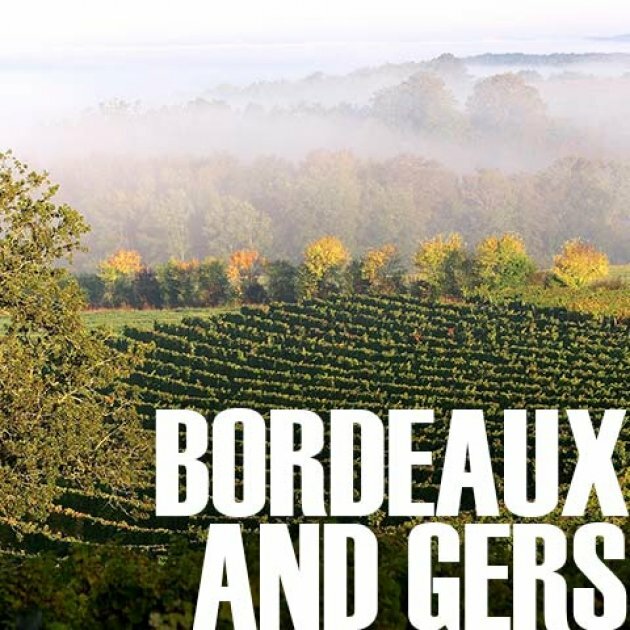 This is a 20-part series about some of the best wineries in the Bordeaux region, France. Produced for James Cluer, Master of Wine at Fine Vintage Ltd.
Gironde – still a river? Beautiful pictures taken by a drone of the “îles de l’estuaire de la Gironde”. Some impressions of the Bassin d’Arcachon between Cap Ferret and Andernos. Typical stilt houses against the background of the biggest dune in Europe. 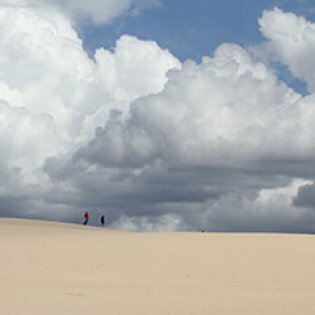 Views from above of the famous „Dune du Pilat“. Maybe a gimmick, but a beautiful one.